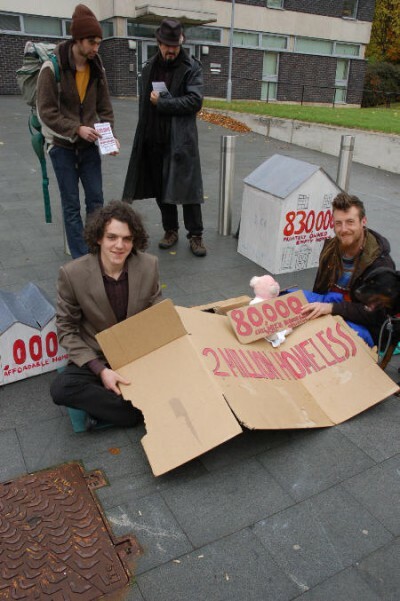 Tristan’s supporters set up a protest about homelessness and squatting on the court forecourt, complete with cardboard, sleeping bag, visual statistics about empty homes, teddy bear and a friendly dog on a piece of string. Flyers were offered to everyone entering or leaving the court. The protest proved very timely as no fewer than ten repossession cases were being heard that day in the County Court in the same building, four of them brought by the local Flintshire County Council. I, Tristan Dixon, was arrested at around 5pm on 17th January 2013 in Moelfre, Powys for being in a formerly beautiful but completely derelict cottage by a lake, which the rich owner had unfortunately left abandoned to be condemned. It is common for property owners to build a larger holiday home once derelict status is given and so increase the value of the property. I was illegally evicted by the police, who had not at that time even verified who the rightful owner of the house was, or had consent from the owner at that time(a legal requirement for eviction by police from a ‘residential’ property), instead being notified by neighbours. The property in question was in a bad state of disrepair needing extensive repairs to the roof, floor and walls to the tune of £60,000-90,000. My intention had never been to live in the property but to use the land to grow trees and vegetables. I was bailed to the Magistrates Court in Welshpool for trial. Squatting peoples’ homes when the owners have gone on holiday has been illegal since 1994. The Criminal Justice and Public Order Act 1994 protects ‘displaced residential occupiers’, and therefore squatters had no right to occupy a used residence which has been temporarily vacated. Section 144 of the Legal Aid, Sentencing and Punishment of Offenders Bill introduced September 2012 made it a criminal offence to sleep in abandoned or even completely derelict residential buildings, therefore making a homeless person sheltering from the elements in a wreck a ‘criminal’. Therefore making second and third etc homes protected no matter the condition. I was convicted in the Magistrates Court of Squatting (a new offence under section 144 Legal Aid, Sentencing and Punishment of Offenders Bill brought in September 2012), and appealed the squatting conviction to the crown court. This is the first time a squatting case has been appealed to the crown court. When the appeal was later heard in the crown court the Barrister and Solicitor representing me were astonished at the level of incompetence across the board; of the police (having charged me with an unlawful charge), my previous solicitor Stephen Scully from Lanyon Bowdler (not having noticed or challenged the charge previously), and the magistrates court (not having noticed that the charge was defective). The appeal case has now been further adjourned to 6th NOVEMBER due to the confusion this caused. In the interim I have recently received a letter from the CPS stating that; ‘there is No Public Interest in contesting the appeal’ and that I should ‘confirm so the matter can be dealt with administratively’. This is because they want to avoid humiliation when the matter goes to court, and also to avoid setting a precedent for future court cases. It is in the public interest to have the case heard, in order that vulnerable homeless that take a nights shelter in a ruined building may stand a better chance of ‘fair’ treatment. However I have decided to continue with the appeal in court and will be attending court on 6th of November, as it is my legal right to a fair trial in the court, and this trial in court will set a precedent for future cases as mentioned, so you see its importance. This is the second time a squatting conviction has been appealed in the UK crown court. In court yesterday, Tristan – who was represented by independent barrister Alistair Mitchell – attempted to assert his right for his case to be heard so that the relevant issues would be properly considered. He’d filed a motion to have the initial charge quashed. The Judge at the previous Crown Court hearing was reported to have been sympathetic and interested in legal aspects of the case but Judge Rowlands was not of the same mind, threatening Tristan with the possibility of exorbitant legal costs if he insisted on the case being heard. Some of the issues over the original conviction were that the charge was ill-founded, failing to address knowledge of trespassing and charging Tristan with ‘living’ or ‘intending to live’ in the property without specifying any period of time, as well as conflating these two alleged offences (‘living’ and ‘intending to live’) into one, creating what was in effect an uncertain charge. In the end, Tristan settled for an acquittal rather than insist on a full hearing with its associated cost risks, then came outside with his barrister to join the protest on the court concourse for another hour or so. Don’t plead guilty. Presence in a building where someone is living is not enough, they have to prove with documentary evidence that you as an individual actually live there. So take our advice – give a ‘no comment’ interview and take it to trial.